Get out there, meet people and immerse yourself into the community. 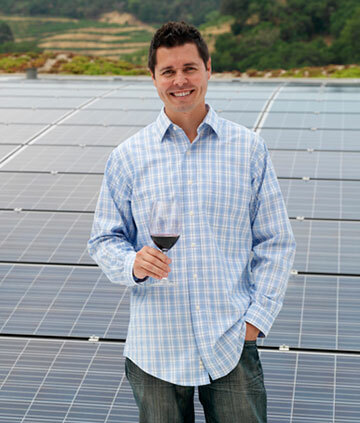 If he weren’t a winemaker, Jeff would like to design golf courses. I positioned myself to be a part of the first graduating class in Wine and Viticulture from Cal Poly San Luis Obispo and squeezed in a tasting room job on the weekends. My first “mind-blowing wine” was the 2001 Shafer Hillside Select. This is the moment I knew I wanted, and needed, to work with Cabernet Sauvignon in Napa Valley. Tony Biagi was my boss for six years and my mentor. He introduced me to the fine wines of this world and helped me grow as a manager and winemaker. Creating memories! Seeing all of the hard work that went into crafting a bottle of wine being shared and enjoyed with friends, family, colleagues and consumers. I think it’s a combination of incredible people and terroir, which are two things that can never be replicated!. We just finished building our brand new winery to LEED Gold specifications, with a living green roof, solar panels and recycled shipping containers. It is important to us that we set up future generations with green building and organic practices in the vineyard. My wife and my parents. Jump right in and go for it! The best way to get started is to get out there, meet people and immerse yourself into the community.